So we're going to build this exploding heart, except just know Twitter kind of cheated. Not really but they used an image and played each frame adjusting background-position so it looked animated. Okay not cheated they used a really smart technique but what's the fun in doing that when we can build it for real! I've already built a Firework concept here http://browniefed.com/blog/2015/08/29/react-native-animated-with-react-art-firework-show/ and about Hearts here http://browniefed.com/blog/2015/09/07/react-native-periscope-hearts-animation/ now we just need to bring them together. Rather than iterating over 28 separate image frames what we're going to do instead is make some pseudo-keyframe-animations. We'll use Animated of course. We'll define our range from 0 to 28. Meaning we'll have 28 frames to deal with. This makes the math easy, because we can walk through each frame, and describe what the animation should look like for each frame. We'll need to setup ReactNativeArt in XCode, you can check out how to do that here. Things to call out here is we are creating a custom animated view, called AnimatedShape. We pass in the art Shape component into Animated.createAnimatedComponent. This allows us to use Animated values in any component. var HEART_SVG = "M130.4-0.8c25.4 0 46 20.6 46 46.1 0 13.1-5.5 24.9-14.2 33.3L88 153.6 12.5 77.3c-7.9-8.3-12.8-19.6-12.8-31.9 0-25.5 20.6-46.1 46-46.2 19.1 0 35.5 11.7 42.4 28.4C94.9 11 111.3-0.8 130.4-0.8"
More setup here. We create our heart SVG path to render, and setup a bunch of colors that we will use in our animations later. We need to set stuff up as rgb or rgba so that Animated can interpolate it correctly as at the moment it cannot do hex values. Yes more setup. getXYParticle is a function I've modified from the fireworks particle blog post I wrote. This essentially distributes a random number of particles around a circle. This is what we will use for the little particles that blow up. The getRandomInt is pretty self explanatory, but it just returns a random number and we'll use it to create some variance. shuffleArray also just shuffles things in an array, we'll use this to achieve random color effects later. We setup a blank canvas. We need to create our initial animation value so we just do a new Animated.Value(0) in our getInitialState. We setup a TouchableWithoutFeedback for the ability to use onPress to trigger our animation. We then setup our ART Surface to fill the screen. Our explode function kicks off our animation and we do it over 1.5 seconds. We will animate to 28 because that is how many "frames" we have. Don't worry about the callback, that's just to reset the animation when it is done, and also the forceUpdate re-renders so we get new random values on each subsequent trigger. We just render a heart, pass in our SVG path, put it at the top left 0,0 coordinates. Scale is set to 1 and we fill it with our GRAY_HEART_COLOR we setup above. Before we dive in I want to explain what is about to happen. The original Twitter exploding has 28 frames. Our animation will start at 0, and that is our default state. So we'll need to set everything up to default when we start 0 (initial render). Then anytime from 1 to 28 we will need to design our values so that they produce the correct frame animation. Animated provides a way to interpolate. What that means is given a value, we want it to go through a formula and spit out another value. Animated does this via ranges, which can at times be a little inflexible and we have to hack around it's shortcomings to get desired effects. All (well almost all) our animations will be interpolating from the single this.state.animation that we created earlier. This just makes it easy to comprehend and layout your animation frames. Because you can then specify that something happens at frame 10 instead of dividing 1/28 and say start at 0.03571428571. Alright there is a lot going on. Lets break it down. We interpolate on the this.state.animation and give it an inputRange and outputRange array. These must have the same amount of array values. I talked about some weird things with Animated and setting up defaults. Well inputRange: [0, .01], outputRange: [1, 0] is the first example. At 0 we want it to be fully scaled, so output at 1. However as soon as the animation is triggered we want it to be at 0. If we only specified 0, 1 as the inputRange, it would have the heart scale down from 1 to 0. So specifying the scale inputRange at 0 => .01 means it'll basically disappear. It's essentially a way to make an animation not a whole frame, and or happen virtually immediately. There is a slight spring in the heart. So from frame 10 to 12 it will spring up fast to 1.2 scale, and then slowly fall back from 1.2 to 1 from frames 12 to 18.
extrapolate: 'clamp' IS EXTREMELY IMPORTANT HERE. If we want it to just stay the same once it hits frame 18 and not do anything else until the end we must add the clamp. Otherwise it will continue to animate at the current stepping value, so it would scale down below 1 and we don't want that. We have the heart hidden after frame 1, so what this animation says is at 0 , inital render, be gray. Anytime from frame 2 and out be red, and always be read. This is the one part where we don't want to base things on the key frame. Because there is no transform-origin like there is in CSS, the default scale will scale out to the top left. That isn't what we want. So to scale out to the center we need to animate the x/y while scaling, so we interpolate off the interpolate for scale. Remember we default our scale up above to 1, so we are reversing stuff here saying when the scale is scaling down from 0 to 1 adjust to 90 for x and 75 for y. The 90/75 just has to deal with the current surface center. We use our AnimatedShape and pass in the animated values we created. A lot of things I explain up above are the basic concepts through out this tutorial so I wont' explain them again. This is taken from previous firework demos and default ReactART, but I've converted it to use our AnimatedShape we created up above. We render an arbitrary circle, at 90 and 75 which is the center of our current surface. Alright so we scale up, based on the image we scale up to .3 in a single frame, then over the course of 3 frames we scale up our circle to a scale of 1. Our stroke width also changes however we won't always render it. We only need it for a few frames starting at frame 6. So we will specify that the stroke width stays at 0 from 0 to frame 5.99. Then over the course of 1 frame it goes to 15 which I chose at random, down to 8, and eventually 0 by frame 10. We specify a range of colors in the array I talked about in setup. The weird part is that we have to specify the final color a few times before setting the fill to transparent. The reason is that if we specify just the transparent color the purple color will fade out to transparent but we want it to completely disappear and just show the stroke. So we have to coordinate stroke frames appearing with the fill color disappearing. Finally our opacity stays 1 until frame 9.99 (the end of our circle stroke) then we kill it on frame 10. We put those in and because our stroke color is always the same we just reference our fill colors. Alright now we setup our final piece. Calling getSmallExplosions with some data. In our case the radius of our circle and the central coordinates. Not going to explain this one too indepth or I'll keep repeating myself. We create a bunch of animations for each particle but add some randomness into the mix. We call shuffleArray on our PARTICLE_COLORS so over the course of the frames it is active it'll animate to random colors for each particle. Also we add a bit of rotation to the group, so when we animate the particles up/down they'll go in all different directions. Now you too can add a new interaction that all of your users will despise! 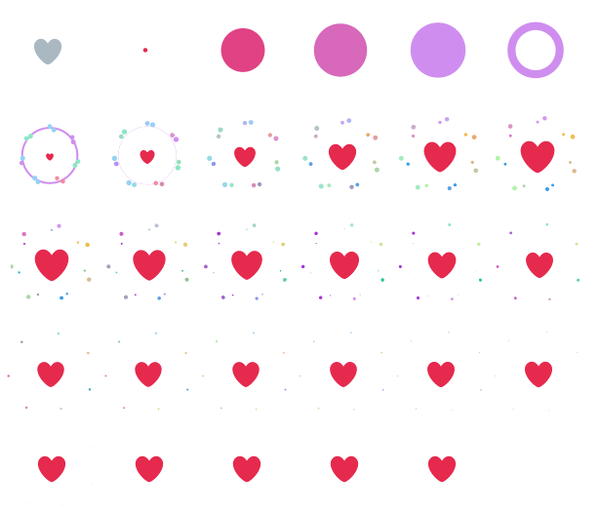 No this isn't a perfect replica of the the Twiter animation because I added color variance and some random rotation to the small exploding/shrinking circles. I'm not posting the full code, this is a long one. Just check it out on RNPlay.